TOSCA project consists in the development of a coastal continuous monitoring & forecasting network based on HF radars & new generation drifting instruments & models, aimed at optimizing the response of local authorities to marine accidents, with a special emphasis on oil spill pollution & on search-and rescue (SAR) operations. The GIS TOSCA tool will allow you to visualize and download the Observation surface current data sets, and to play with the Lagrangian tools to simulate and correct the dispersion patches. The TOSCA GIS is a web support tool aimed at helping decision making process in case of a maritime accident. The sytem is currently a prototype based on the project observational network and data gathered during the project experimental phases. In the right window the test site and the date can be chosen. The real-time is accessible only on the Var coast (meaning that the GIS TOSCA can deal with RT HF radar). You can change the velocity palette and move forward/backward in time. In the lower window (Synthetic View of available Radar Data) the table summarize the available IOP according to the test site. You can click on a decade, and the corresponding site & period will be mapped. 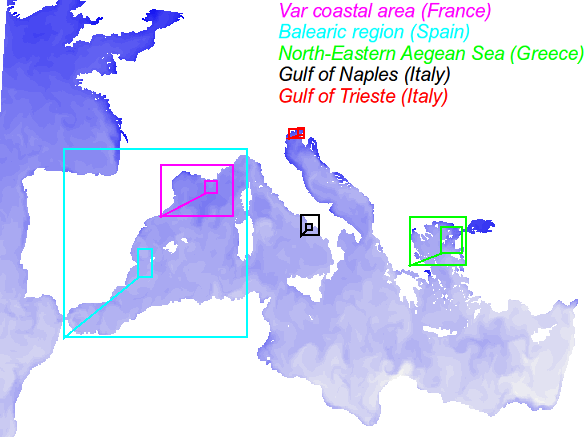 The 5 TOSCA test sites where the Intensive Observation Periods (IOP) have been carried on. The large box corresponds to the model area, and the inner one corresponds to the radar coverage. The color depends on the geographical site. Time Distribution IOP The color depends on the geographical site.